Combining the refined and lavish look of high quality velvet fabrics with the elegance of richly patterned brocade, the Mens Ornate Renaissance Jacket is an extravagant reenactment jacket modeled after authentic Renaissance styles. Golden lace trim adds a regal touch to this historic inspired piece. Fully lined for comfort, this jacket features an open front with decorative buttons. The sleeve cuffs and both front and back panels feature the patterned brocade fabric while the majority of the jacket is handmade from velvet. Choose from various stylish color and fabric combinations, including both antique velvet for subtle decadence and crushed velvet for unrivaled luxury. The Mens Ornate Renaissance Jacket is ideal for historic noblemans styles. 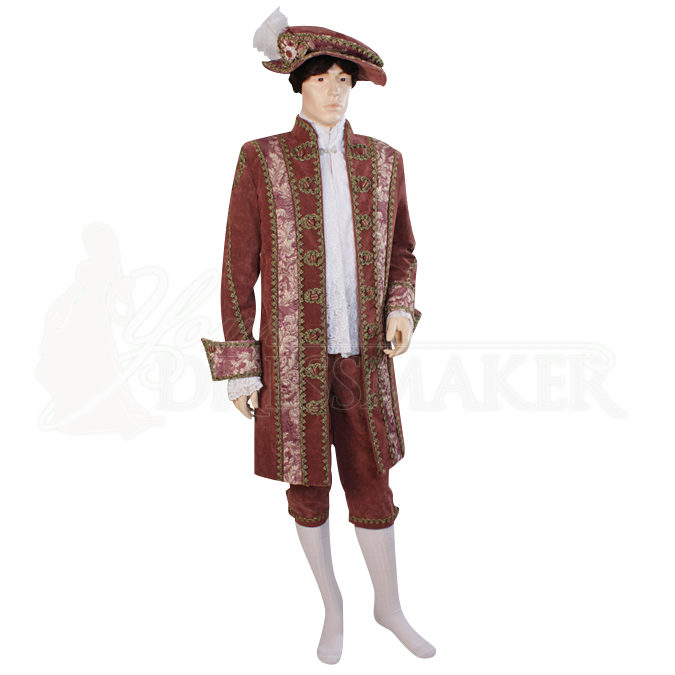 Combine it with the Mens Ornate Renaissance Hat (MCI-397) and the Mens Velvet Renaissance Pants (MCI-386) for a matching ensemble suitable for special costumed occasions, historic reenactment events, and Renaissance festivals.